Under the framework of the ILO project to nationalize KAB in vocational and technical training in Palestine, the implementation phase continues with the introduction of the KAB programme in vocational centres in partnership with the Ministry of Labour (MoL) and in secondary vocational schools in partnership with the Ministry of Education and Higher Education (MoEHE). A 12-day Training of Facilitators took place from December 20th until December 31st, 2015 in Hebron, with the aim of introducing the KAB curriculum to 25 teachers, 8 from vocational training centres functioning under MoL and 17 from secondary vocational schools functioning under MoEHE. The workshop was facilitated by KAB National Key Facilitators (NKF) from Palestine Mr. Abdullah El Silawi from MoL and Mr. Raed Abou Menshar from MoEHE. The workshop was attended by 25 participants (13 women and 12 men) who appreciated the presence of trainers from both ministries and considered it to be a good learning experience. One of the recommendations made by the trainers is for ministries to organize follow up visits and monitoring to all the facilitators implementing KAB with students. A refresher workshop is expected to take place when facilitators complete the delivery of the first four modules of the Programme. Under the framework of the ILO project to nationalize KAB in vocational and technical training in Palestine, the implementation phase continues to introduce the KAB programme in vocational centres in partnership with the Ministry of Labour (MoL) and in secondary vocational schools in partnership with the Ministry of Education and Higher Education (MoEHE). 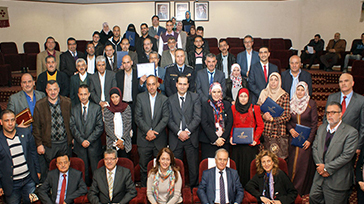 12-day training took place from November 1st until November 12th, 2015 in Nablus, with the aim of introducing the KAB curriculum to 25 teachers, 6 from vocational training centres functioning under MoL, 18 from secondary vocational schools functioning under MoEHE and one official from MoEHE who will serve as a KAB supervisor after completing all necessary requirements. The workshop was facilitated by KAB National Key Facilitators (NKF) from Palestine namely Mr. Abdullah El Silawi from MoL and Mr. Ahmad Samhan from MoEHE. The workshop was attended by 25 participants (8 women and 17 men) who showed a high level of involvement and commitment. A refresher workshop is expected to take place after facilitators complete the delivery of the first four modules of the KAB programme to students. Under the framework of the ILO KAB project with the Business Development Centre (BDC), a follow-up KAB workshop targeted vocational education teachers in Northern city, Irbid. The workshop held from 28 to 30 August, 2015, was facilitated by Ms. Rania Bikhazi, KAB International Key Facilitator (IKF) and Mr. Abduallah El Silawi, KAB National Key Facilitator (NKF) from Palestine. This was the second refresher workshop and it was attended by 29 participants (11 males, 18 females) from 16 vocational schools who delivered the full KAB program in one year (2014-2015). During the training workshop, participants shared experiences and presented challenges faced and lessons learned. Many participants showed pictures of their classrooms while implementing KAB highlighting the participatory aspects and the creativity used in the teaching. Main challenges expressed by the participants were tackled with immediate solutions by BDC KAB Coordinator Mr. Ghaleb Hijazi and Mr. Tahsin Gfishi, KAB Supervisor from the Ministry of Education and Vocational Training. Some of these challenges were issuance of student certificates, provision of stationary, timely issuance of official letters from the government, and compensation means for facilitators. The participants showed a high level of sharing and commitment during the workshop. KAB facilitators will be delivering a second round of KAB courses during the 2015-2016 academic year in the hope of reaching a nationalisation decision soon.